J1：Your jewelry seems to bring us toward another world. Is that world the real one? M：It's the realest one. Actually, every Master and every religious scripture has told us that this world is unreal. And the world that we aim toward inside, like what Jesus or Mohammed or Buddha pointed toward, that's the real world. It's the real world that we can find during our moments of silent contemplation, and the jewelry here is just a reminder of the beauty inside. J1：Why did You go so far as to give a meaning to each piece of jewelry? M:It's because I think that the greatest aim in this life is to find the Kingdom inside us, to find the wisdom or the Godhood inside us. So anything we can do toward the act of bringing us to this Kingdom is the perfect way. Be it jewelry, be it clothes, be it the way we live our lives, everything we do must bring us toward the remembrance of the Kingdom of God. That should be the goal of our life. J1：Does Your jewelry have an influence on the people who wear it or the people who are around it? M：I think people also influence themselves. If they've chosen this kind of jewelry, it means they already have this kind of tendency. They want to remember the Kingdom of God; they want to remind themselves and surround themselves with the Heavenly beauty. J1： How strongly do religion and the Buddha inspire Your work? M：It's not only the Buddha. I'm a disciple of all the great Masters: Jesus, Mohammed, Buddha, you name it. Because all the great Heavenly beings, divine Masters like Jesus, Buddha and so on, all teach us the same thing. They teach us to be a good guest on Earth, to live a good human life, and to remember the origin, which is the Kingdom of God or the Buddha's Land. These are named differently, but they're the same to me. J1The word that sums up this collection: Is it "God?" Is it "wisdom?" Is it "Heaven?" What is it? M：We call it "Celestial Jewelry," "the Celestial Collection of Beauty." For example, we have a whole collection of clothing and interior decoration items such as lamps and paintings. Everything I do is inspired from Heaven. I don't think that I, as a mortal, am capable of creating such beautiful things. They're just inspired from Heaven so we call them "the Celestial Collection of Beauty." J1：Clothing, jewelry, poetry: You seem to be interested in everything. Do You have one thing that You prefer, or do You like everything? M：I actually like everything that I've done. Because it's not me who did it; it's the Father inside who inspired me and helped me to bring it into realization. Because I never studied these things before: I never studied painting or design or jewelry or clothing. I never had any idea about these things; it just came after many years of meditation practice, of going inside and finding wisdom. J1：What's the purpose of the jewelry that You create? M：The first aim is to remind people of the beauty from Heaven. That's why each design has a name of its own. 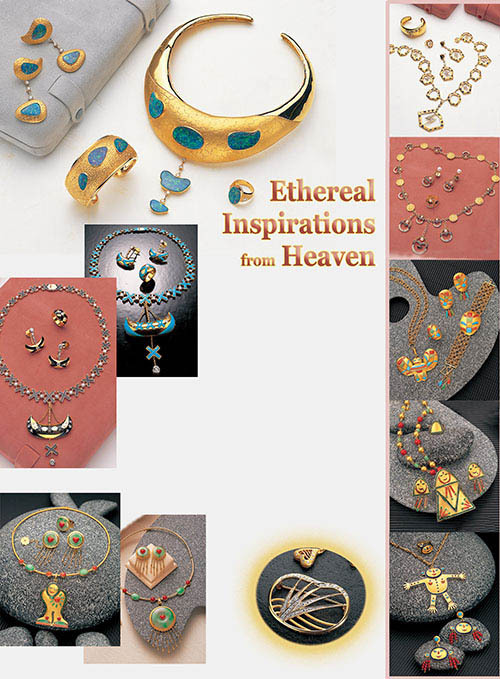 The general name is Celestial Jewelry, and each design has a very spiritual name such as To the Other Shore, or Liberation, or Wisdom Eye, or The Future Buddha, or Meditating Quan Yin, or Bodhidharma, or God's Child, or Little Angel and so on. All these are noble names from Heaven to remind us of our own Nature within. And the second aim is to earn some money for myself so I don't have to rely on my disciples because I never take donations. Of course, the jewelry, fashions and paintings earn a lot of money. And this money I want to give to people who are in disasters or in need, like in poverty or an emergency. J1：How much time do You need or take to create? M： Each piece is different. Some take longer; some take shorter. The longest would be about a week, and the shortest perhaps a day or even half an hour; it depends. Sometimes I'm very inspired: In one day, I can make about ten or twenty designs or in one night perhaps thirty clothing designs. At those times I don't sleep all night. I work from dusk until the next dawn. J1：We know that You're very busy. How do You find time to do that? M：Because as I said, sometimes I'm inspired. I can work the whole night and whole day and then finish one section very fast. And I just do it when I have time. If you want to do something, you'll find the time for it. J1：Is the artistic inspiration contagious to Your disciples; do they become artists, too? M：Yes! Some of them also suddenly become artists overnight. And they suddenly write poetry, or suddenly know how to paint or design their own clothes. That's very good. It's not really "contagious"; it's just the meditation that brings out the best in people in time. J1：Do You happen to refer to what other designers do and learn from them? M：No, I didn't do that before. I never had any idea [about doing that]. I just did it from my own creative inspiration. But after I was done creating things in different fields, of course by chance, I would get in touch with many other artists, and sometimes we would exchange ideas. But that came afterwards and was a consequence of my exhibitions or my creative objects. J1：Concerning Your source of inspiration, where do Your visions and colors come from? M：From inside, from inside my brain! Sometimes the colors and pictures come before I can paint them out. So I have to do it fast before I forget. J1：I have one technical question about Your jewelry: I know that inspiration is very important to You, but do You also pay attention to the materials you use such as diamonds and so on? M：Yes, we do pay great attention to details such as the materials. For example, we use the best, most reputable gold and the best stones, and we choose the colors. For example, this (indicating one of the opals in the necklace The Hidden Force Connection) is a very rare color, and the size is very rare, too. To have a piece so big and so beautiful as this is rare. As for the gold and all the precious and semi-precious stones, we choose the best to represent the flawless Heavenly quality. J2：I would like to know if You give meaning to Your jewelry. For example, if You see a piece of jewelry that You didn't make, would You give it a meaning, even if it's not from You? M：Well, I think that if some other artist creates his or her own piece of jewelry, he or she is the only one who has the right to give meaning to the jewelry. So, I don't interfere with people's creations and their inspirations or their right to their own thinking. I just take it as a piece of art. And if the creator of that piece of jewelry gives a meaning to it, then I accept it. But I wouldn't give my own interpretation to other people's inspirations in jewelry, or any artistic piece. M：You're welcome. Are you satisfied? J2：Yes. It's just that I have another question: I want to know if I show You my ring, will You give a meaning to it? M：Did you create it yourself? J2：Oh, no! Not at all. M：Then I don't think I'm allowed to give a meaning to someone else's state of mind. You should ask the creator of this piece to give you the meaning, OK? I think we must respect everyone's private individual inspiration and artistic tendency. I don't always wear the jewelry I've created; I wear anyone's. If I see a nice piece that's suitable for an occasion, I'll sometimes buy it. And sometimes I buy things to give to people. But I don't give meaning to anything like that; I just buy it. J2：I wonder if You would describe and tell us why You're wearing the jewelry collection that You are today? M(Referring to The Hidden Force Connection necklace and earrings Master was wearing) Today it just happened that I wore green, [almost] the same color as the opals so I thought they matched. I normally match everything to create a harmonious look so that when people see me, they'll see the oneness and no contrasting or fighting energy around my body, and so that everything I wear represents peace and harmony within and without. J2：And which materials represent perfection to You, or what's Your preference: Is it diamond, gold or what? M： I think everything that God created, even a piece of a pebble, is perfect in its own way. It's just that in this world we've chosen those rare and shinier stones to represent our inner shining quality. So likewise, I have to choose them; for example, diamonds, opals, rubies and so on. Since the people of the world like them, I can't just give people things that they don't like. I have to create with the things that people already like and are familiar with. The reason people like shiny objects is that somehow in the deepest corner of their hearts, they still remember the shining quality or the Light within. That's why people love diamonds and rubies, not for the material possession of these things but because of the yearning in their souls to go back to the Light, to the shining and lasting quality of our inner Kingdom. So likewise, I use these everlasting things. J2：Does this "Light" refer to the Light that touched You like You also mentioned with the Buddha? M： It's the inner Light. And the Buddha had the Light shining around His head like you see in the picture, Jesus also had a halo around Him and so on. All the Saints, when depicted in a Saint's picture or statue, have a halo of light around them. They really do have it. Sometimes we can see with our wisdom eye that a Saintly person has light around him. We all have different light. Some people have purple light and some have a kind of black light. But the spiritual Master has brighter light, very bright. So, most human beings love diamonds, rubies, sapphires and so on because they shine. They really resemble the Light within us when we find enlightenment. That's why we say "En-lighten-ment," meaning light, we enlighten. That's why people love diamonds and rubies; I think the deeper reason is that people love the Light within themselves and they yearn to know it again. They've forgotten it and they want to remember. That's why people love diamonds and other shiny objects like gold, silver, sapphires and so on. J2：And maybe because it lasts, and they want it to last by wearing jewelry. M：Yes! Because it's everlasting, and our true Self is everlasting. So, when people love all this jewelry, like diamonds and gold and so on, I think they just yearn to remember their everlasting Self, the soul within themselves. So, it's not really the material that they love. It's the spiritual memory, the remembrance behind all these shiny objects that makes people love them so much, not only my jewelry but any jewelry. I think the reason that people love shiny jewelry is that it reminds them of their own shining quality inside.